Barska® Cantilever Mount with Integrated 30mm Rings and Rail. Pair of cantilever flat top AR rings with integrated 30mm ring and 1 detachable rail top with 1" inserts. 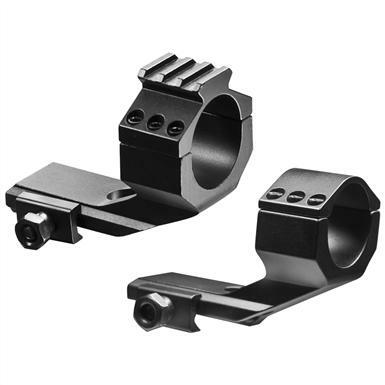 This forward offset Mounting Ring allows mounting of longer riflescopes on your flat top AR. Includes Picatinny rail top for mounting optional shooting accessory. 6 heavy-duty screws keep the optic in place and a large thumb lock screw keep the Mount securely on firearm. Barska Cantilever Mount with Integrated 30mm Rings and Rail is rated 5.0 out of 5 by 1. Rated 5 out of 5 by VAUGHN from great mount works great on my new leatherwood dominator 6-30x56mm. thank you S/G.===BY THE WAY THIS SCOPE IS GREAT. 5 STARS MOUNT AND SCOPE.